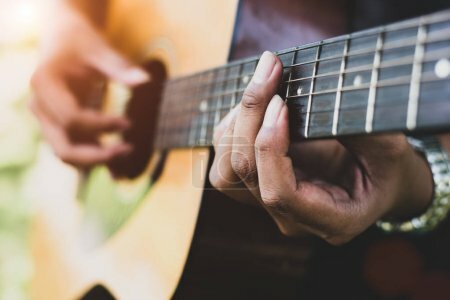 Фотобанк Rusmediabank – лицензионные Фото, Видео, Музыка - Close up of guitarist hand playing guitar. Musical and instrument concept. Outdoors and Leisure theme. Selective focus on left hand. Close up of guitarist hand playing guitar. Musical and instrument concept. Outdoors and Leisure theme. Selective focus on left hand.